I am lucky enough to have traveled. And like many people the food I’ve eaten is inseparable from where I’ve been. During a literary pilgrimage to Oxford I ate incandescent fish and chips at the pub where J.R.R. Tolkin and C.S. Lewis critiqued each other’s works. My friend Brenden hosted a bastardized sedar dinner in the unfinished basement of a hostel in Vienna when we were both lonely and homesick. Aaron and I spent a day in Prauge wandering Vysherad cemetary and eating juicy pork sausages and cloudlike dumplings we found in an underground restaurant where the menu was not only in a different language, but a different alphabet. And for every place that I’ve gone, there are five nudging at my brain to be next. Unfortunately my desire to travel far exceeds my funds and vacation time. So when I have wanderlust I turn to food. I don’t think I’m alone in fantasized about being in Tuscany when eating a dreamy plate of homemade pasta, or wandering the streets of Tokyo when slurping down ramen. I love to eat out, but often when the urge for some specific place strikes me I want to cook. For one, it’s hard to find, say, Moroccan or Basque or Punjabi restaurants in Minneapolis. But even if it were possible, there’s so much to learn by cooking. It’s possible to try and taste and tease out flavors, to attempt new techniques, and explore new ingredients. All you need is a capable guide. There’s been so much said about the brilliance of Heidi Swanson that it doesn’t bear repeating. But I can say that food blogs would be an entirely different beast if she had not created 101 Cookbooks, and my copy of Super Natural Everyday is dog eared and sauce splattered. When her newest book, Near and Far was released a few weeks ago, I was at the bookstore within a half hour of its opening. I spent hours that day making a list of everything I wanted to cook from it, and that list tops fifty items. It was tough to decide what to start with. Would it be the rye pound cake from the San Francisco section? Miso oat porridge from Japan? Sabayon from France? Eventually I was pulled to the Moroccan section. Morocco has long sat on my list of places to visit. I had heard about Harira before, the spiced soup that’s traditionally eaten to break the fast during Ramadan. There doesn’t seem to be a capital D definitive version of harira, other than that it is lentil and tomato based, and steeped in spices. Heidi’s harira recipe uses cilantro in three different places, lemon for freshness, chickpeas and pasta for heft, and a heady mix of cumin, red pepper, cinnamon, paprika, and saffron. The taste twists and turns on your tongue- spicy one moment, refreshed the next, then sweet. Every bite is different and every bite leaves you wanting just one more taste. Although I made it to calm my wanderlust, the hariria has only ignited it further. I can’t wait to see what’s next. I made very few changes to this recipe. I substituted the angel hair Heidi suggests with whole wheat spaghetti, because that’s what I keep on hand. Heidi also calls for fresh dates, but that’s not available to me, and I found dried dates did the job more than admirably. Finally, Heidi calls for canned whole tomatoes rather than diced. If you do use whole tomatoes, try to break them up a bit with your whisk before adding them to the pot. Separate the cilantro leaves from the stems. Finely chop about two thirds of the leaves and reserve. Finely chop the cilantro stems. In a large soup pot heat the olive oil over medium high heat. Add the onions, celery, garlic, ginger, and cilantro stems. Cook, stirring occasionally, until everything softens, about 5 minutes. In a mortar and pestle finely grind the saffron with the salt. Add to the pot along with the cinnamon, paprika, pepper flakes, and cumin. Stir well. Add the chickpeas and lentils, then add 4 cups of water. Stir well, and bring to a simmer. In a large bowl, gradually whisk in the remaining 2 cups of water with the flour, being careful to pour in a little at a time to avoid lumps. Add the lemon juice, the tomatoes and their juices, and the chopped cilantro. Add the flour-tomato mixture to the soup and bring back to a simmer, stirring often. Once the soup is at a simmer, cook another twenty minutes or so, stirring often, until the lentils are cooked. 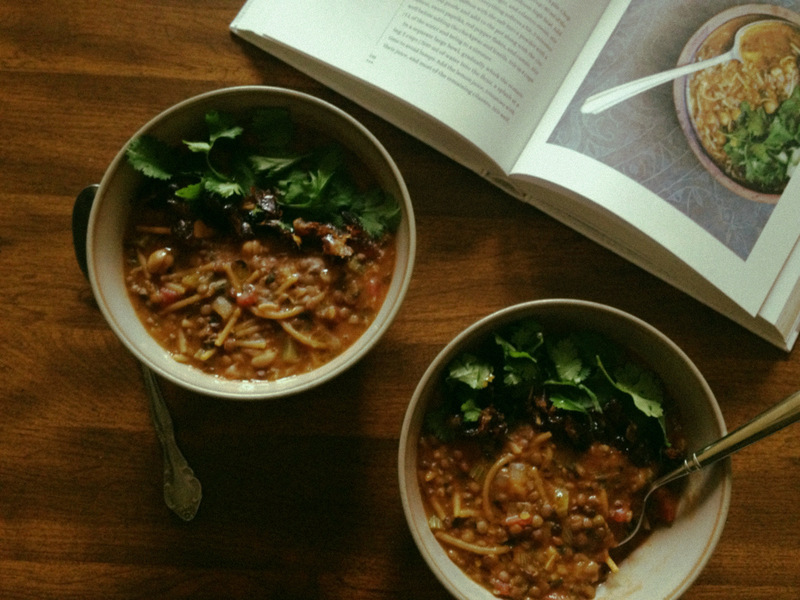 When the lentils are ready, stir in the marjoram and the spaghetti, and simmer until the pasta is cooked. Adjust for seasonings. Serve with the remaining cilantro leaves, the reserved celery leaves, the sliced dates, and olive oil. There were thirteen of us living in the flat, the largest group in years. Thirteen who had decided we wanted to study in England, and Nottingham was where we would go. Thirteen who shared five bedrooms, two bathrooms, one huge living area, a kitchen the size of some suburban pantries, and a library located in the adjacent church. In that year we were so many things to each other- sparing mates, travel companions, intense annoyances, each other’s life lines. We took some classes at the Uni, and the rest were taught by the director from our home college. We traveled together on class outings some weekends, and rotated making dinner every weeknight. At my program interview I was asked if I could cook. My answer was that I could- a little. I enjoyed cooking, but I didn’t feel confident in the kitchen yet. I could assemble a lasagna and make mac and cheese but I was far less certain about cooking for sixteen people (us, our director, her son, and her assistant). I wasn’t the only person who felt this way. It was a huge thing to prepare for. My first few meals were rough- baked crepes, not enough for seconds, with only a salad as a side, for example. We all burned through the recipes that we brought home pretty quickly. And then things started to get interesting. I spent hours trying and failing to perfect gnocchi, but found a leek confit that was perfect with the failed dumplings. Megan, who is a pie whisperer, showed me how to roll out pie dough. Aparna made a fish biriyani so spicy I could barely eat it, but so tasty that I kept trying to power through. Aaron joined a flair bartending club, which led to a job barbacking at a swanky cocktail lounge. There was the milk delivered straight to our door three times a week in liter bottles, cold and sweet and fresher than the expensive local organic milk I buy now, that we added to tea. There were the four cartons of orange juice we went through every week, fresh and juicy without a hint of sugar added. There was the greengrocer we frequented where we bought flats of eggs, dozens of apples, and freshly harvested British veg. When we were homesick we ate food that reminded us of home- mac and cheese, orange chicken, tacos, carnitas, enchiladas. And we were homesick a lot. But life was also so full. Nottingham was pub quizzes where we drank real ale and house made cider at a pub where the worn armchairs were arranged around the fireplace. It was the Halloween we threw a murder mystery party set in the twenties where we all died. After we finished we got drinks in costume and belatedly remembered most Brits don’t celebrate Halloween. It was having eighty people over for Thanksgiving and still attending class that morning. It was baking at midnight and dressing up as Rita Skeeter for a Harry Potter premier and the buses closing down once snow appeared on the ground. It was learning to ask how much a cab would cost before getting in because of our accents inflated the price, and drunkenly exchanging phone numbers with English girls in the bathrooms of bars. It was five years ago. It feels like ten. It feels like yesterday. 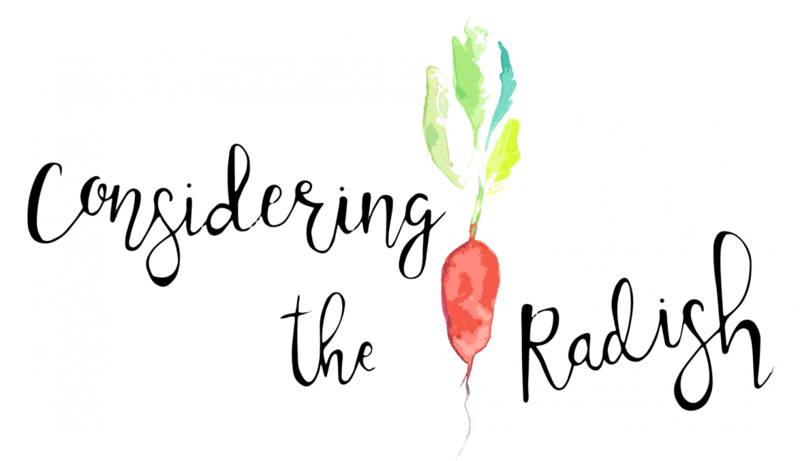 I discovered food blogs right around this time, and cooked from them religiously. One of my first discoveries, and my favorites, was The Wednesday Chef. I made so many things from her site that year that I still love- eggplant sauce, rhubarb cake, chard and onion panade, braised leeks. But the one thing I found on her site that year I still make religiously are the zucchini pancakes. They are quick, easy, healthy, impressive, and delicious. When zucchini is in season I make it once a week. It’s a recipe that I’ve memorized the proportions for, and as long as you’ve got that down you can freestyle. Feta and mint, mozzarella and parsley, shallots or garlic or scallions, zucchini, no zucchini. It’s all good. I made these variation recently for lunch with Aaron. The flavors are for fall, with earthy sage, rich cannelloni beans, and sharp white cheddar. The kale ribbons its way around the squash, and the nutmeg brings a woodsy warmth. It’s delicious on its own, but incandescent with nostalgia. These are endlessly adaptable. You can substitute in different cheeses, herbs, flours, and vegetables as you desire. As you make substitutions, just remember that the batter should resemble a thick pancake dough, and adjust the amount of liquid accordingly. In a medium sized bowl combine the summer squash and the half teaspoon of salt and mix well. Let it sit to the side for five minutes, then place the summer squash in a clean towel. Over the sink squeeze the majority of the liquid out of the summer squash. It will not be everything, and that’s fine. Place the drained squash in a clean bowl. While the squash is sitting, roughly mash some of the beans in either a mortar and pestle or a bowl with a fork. You want some beans smooth, some beans whole, and some in between, and the exact ratio depends on how much texture you want in your fritters. To the drained squash, add the mashed beans, kale, cheddar, sage, and spices. Mix well. Crack the eggs in the squash mixture and mix so everything is incorporated. Add the olive oil and flour, and mix to make sure everything is evenly incorporated. If you are concerned about keeping the first fritters warm while the remaining ones cook, preheat your oven to 200. Place a large skillet over medium heat and add a tablespoon or two of olive oil. Let the skillet warm for a minute, then add the squash batter, one large spoonful per fritter. I fit about three fritters in the pan at a time, but that will depend on the size of your skillet. Use a spatula to gently pat down the batter to make sure you’re getting plenty of surface area contacting the hot oil. Cook the fritters until their underside is golden brown, about 2 minutes, then flip. Cook until both sides are golden, about two more minutes. Repeat with remaining batter, until all fritters are cooked. If you are worried about keeping them warm, now is the time to add the fritters to the preheated oven. If you are not worried about that, place them on a plate as you cook the remaining fritters. 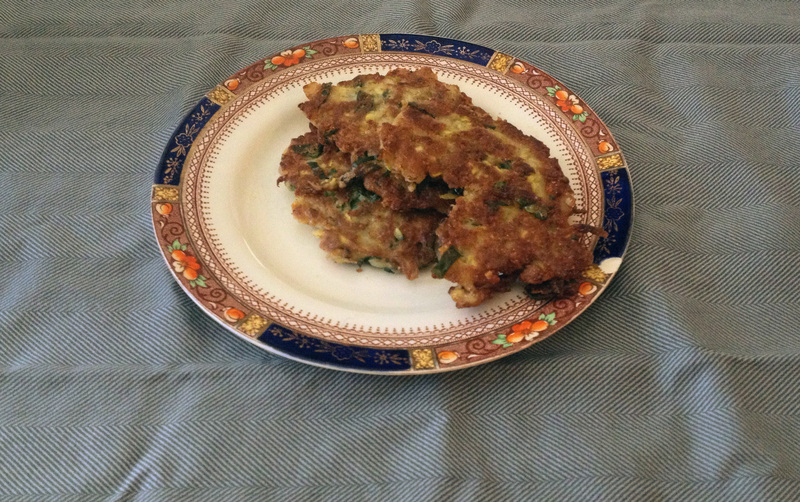 These fritters refrigerate well and can easily be reheated in a microwave or toaster oven. Aaron always eats his smeared with greek yogurt. My mom had two cookbooks, a handful of food magazines, and a white plastic file box crammed with recipe cutting that she kept in the cabinet next to the stove. From this store she made dinner for three kids and my dad every night of the week while working full-time. She’d often do it while working more than full-time. I learned to cook from watching her. She saw that I was interested and able, and started putting me in charge of preheating the oven for chicken or shredding beef for tacos when I was about 13. Our meals were rarely glamorous, but they were tasty, nutritional, and quick. We sat around the table talking about our days while we ate, and could only be excused when we had eaten enough. Once in a while, when she had time and a willing audience, she’d experiment. In the summers we’d make pizza dough and grill pizzas, every person choosing their own toppings. (I always chose every possible vegetable and bacon.) I still make her corn and black bean salsa for potlucks. It was never that she didn’t like cooking, but that it was often the last thing on the list after a busy day. She took care of us in so many ways, and cooking was only one of them. I have, at last count, thirty cookbooks. I make money by cooking for people. I’m not scared to spend an hour or more making dinner. Cooking is something I love, a way that I share myself with people. I know that a lot of people who love to cook feel the same way. But there are also days when I do not have the energy to devote lots of time and effort to making sure I get fed. And then I look back at my mom’s example, and take inspiration from her- fajitas, chili, mac and cheese. My mom knew a good thing when she found it. 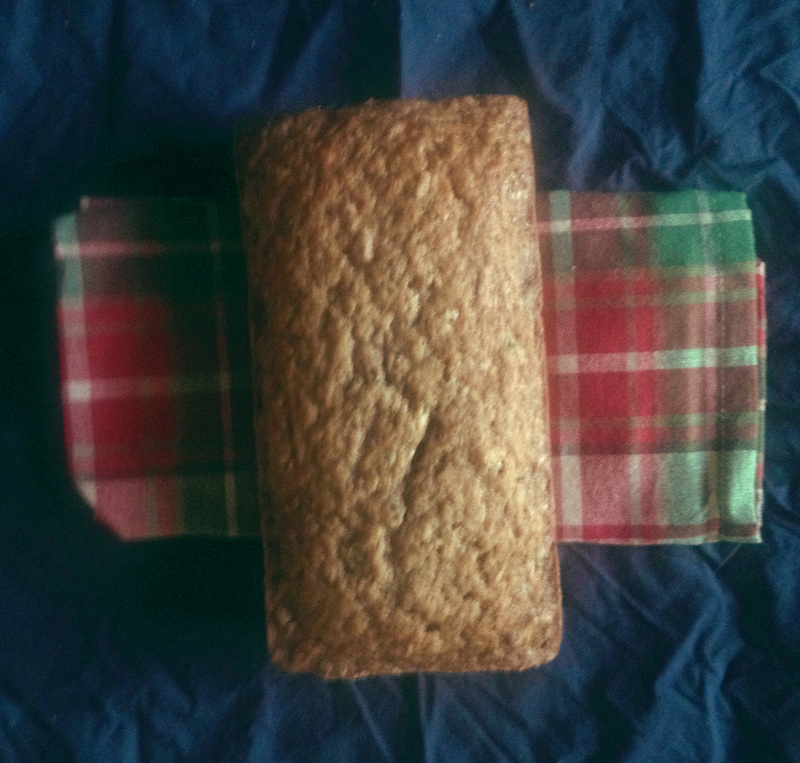 And every summer, when she had more time, she would make zucchini bread. It was lightly sweetened, filled with nuts, and a treat that we could all agree upon. We kids liked it because it was sweet and tasted like cake. She liked it because it was low in sugar and we were eating vegetables for a snack. She made it from one of the recipes that she had shoved in her recipe box, and although years ago I copied many recipes down from there, her zucchini bread was not one of them. Instead, when I got a craving, I had to scour my cookbook selection to find a zucchini bread recipe. And what a find I got. And so in late summer, I used the zucchini my garden is still producing to make zucchini bread. The taste is buttery and tender, despite their being no butter in the dough. The spice is warming and comforting, and the bread has just enough firmness to create a delicious contrast between the crust and the center. It’s excellent as breakfast, a snack, or dessert, and may remind you of getting a treat some lucky summer afternoon from your overworked and underappreciated mom. The adaptions I made were minor- I substituted vegetable oil for coconut oil and allspice for nutmeg. If you wanted to gild the lily, you could toast the walnuts, but I think they’re delicious ungilded. Preheat the oven to 325. Grease and flour two loaf pans. Set aside. In a large bowl whisk together the flour, spices, baking soda, baking powder, salt and nuts. In a medium bowl whisk together the eggs, oil, sugar, and vanilla until the sugar is dissolved. Stir in the zucchini. Turn the wet mixture into the dry mixture and mix until everything is just combined. Divide the batter between the two prepared pans. Bake the bread until it is firm, golden, and a toothpick comes out clean, about 60-70 minutes. Cool the bread loafs in their pan on a cooling rack for about 10 minutes, then invert the pans and remove the bread. Continue to cool with the bread right side up. When my parents took me out to breakfast at our local greasy spoon, I always got the same thing- a Golden Brown Belgian waffle with pecans, and a hot chocolate. It was a mark of maturity when I started adding on bananas. (My dad always ordered, and still orders, a Denver omelette without the cheese, dry wheat toast, extra crispy hash browns, and a small tomato juice. My mom is more adventurous.) I loved the honestly terrible continental breakfasts at bad hotels because they always had a waffle iron and batter. I would drown them in syrup and slather on the butter. In my college cafeteria I would only be deterred from the waffle iron by a line four or more deep. When I lived with friends we had “Shwaffle Sundays”, where we watched Sherlock and ate waffles, and this might ostracize me from certain swaths of the internet, but I was way more interested in the later than the former. And my daily breakfast from age 6 to 16 was an eggo (or four), smeared with peanut butter. Sufficient to say I totally get Leslie Knope- waffles are way up there in the list of what’s important. I love waffles. But I don’t always love how I feel after eating those fluffy, sweet, monsters of waffles. So I’ve spent an obscene amount of time trying to find “my” perfect waffle recipe. We had a good run with Sara’s multigrain waffles, but we don’t always stock almond or oat flour. Aaron raved over Amy’s spelt waffles, and I enjoyed them, but didn’t enjoy beating egg whites into stiff peaks first thing in the morning. I devoured Sarah Copeland’s whole grain waffles from her beautiful book Feast, but never have buttermilk on hand, because it always goes bad before I finish it. It’s not hard to find great waffles, but to find ones that fit some pretty specific parameters that I had- relatively healthy, quick, made with ingredients I always stock, and delicious- was harder than I anticipated. Until, that is, one morning when I swapped out the yeast in Marion Cunningham’s overnight waffles with sourdough starter. The resulting waffles were crisp, light, tangy, not too sweet, and dead easy. They’re pulled together in 5 minutes the night before, then have eggs and baking soda mixed in right before it goes into the waffle iron. The taste is complex with a savory edge. Topped with syrup, it feels like a Sunday treat, and topped with butter and jam, it reminds me in the best possible way of sourdough toast. The only downside to these waffles is you have to prepare ahead. If you want an in depth explanation of how to prepare a sourdough starter, I’d start here. If you’re happy winging it, mix together a cup of flour and a cup of water in a bowl, and cover with cheesecloth overnight. The next day, add another cup of flour and another cup of water, and stir well. Repeat this daily until your starter is bubbly and starts to smell of yogurt, between three and five days. After this, you can start feeding every other day or every three days. And if you don’t want to bother with your own starter but still want waffles, ask around and see if a friend has some starter they’d be willing to give you. The starter will live for as long as it has food and exposure to air. Here’s some other things I’m planning on making with my starter. I wish we still had berries this summer so I could make these scones. And finally, if I didn’t already have my sourdough waffle recipe, I’d be eating these right now. 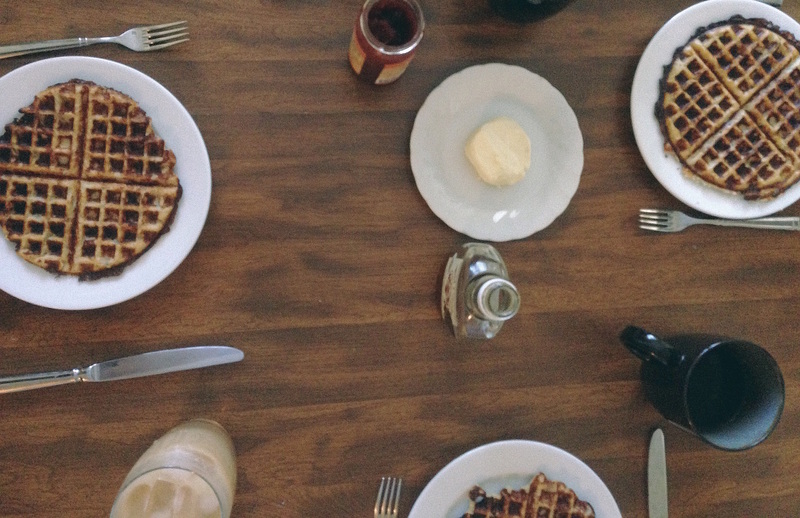 These waffles are super easy, but you have to decide when to make them in advance. Feed the starter two days before you plan on having waffles, and then make the batter the night before. Active time, including those two tasks, is about 5 minutes. In a large bowl, mix together the sourdough starter, salt, and sugar. The batter will be tight and lumpy. In a small pan, combine the milk and butter over low heat. Stir frequently, until the milk is warm and the butter is melted. Add to the sourdough mixture and whisk well. Leave out overnight at room temperature. The next morning beat in the eggs and baking soda and heat the waffle iron. Pour in the amount of batter your waffle iron requires (mine takes half a cup at a time), and let them bake until they stop steaming and are browned and crispy. Extra batter will keep well a few days in the refrigerator. Alternatively, you could make all the waffles and freeze the leftovers. Leftover waffles reheat well in a toaster oven. This dish may be a salad. It does contain quinoa. But please don’t think that means that it is virtuous, or sparse, or diet food. Because this salad is washed in olive oil and kissed with herbs and tastes like those glorious vegetables you get on the antipasta platter at good Italian restaurants. It’s the kind you eat with crusty bread and creamy cheese and drink with bubbly because the vegetables taste like a celebration of their own existence. We ate it in celebration with our old friend Hannah, who is moving to China this week. We brought it for a potluck picnic, and ate the eggplant with shredded chicken and brie and bubbly and cornbread. It was cold enough that I kicked myself for not wearing a sweater, and we definitely could have smuggled in the bottle of wine Aaron talked me out of packing. We ate with mismatched forks and paper plates and drank out of red solo cups, with a band played not far from our perch. After the music was over a cheesy car chase movie played in the park, and we all huddled together wrapped in our picnic blankets while Burt Reynolds drove a Trans Am at 110 mph. Afterwards we had drinks at one of my favorite restaurants and stayed up way too late, laughing and talking and reminiscing. There’s a reason, I think, that some of our best gatherings revolve around food- by sharing our sustenance, we’re sharing ourselves. The eggplants here are shriveled, dark, and concentrated, and have the same earthy richness as mushrooms. The tomatoes (in 2 forms) bring the sweet and savory aspect, and the quinoa provides pleasurable little pops as you take each bite. Japanese eggplants are the long and thin ones that are a beautiful shade of lilac. If you can only find standard eggplants, I would use only one, cut it into cubes, and salt it ten minutes before frying. Za’atar is a Middle Eastern spice blend that I’m infatuated with. I’ve found it at some Whole Foods, spice shops, and our local coop. It usually contains herbs, sesame seeds, salt, and sumac. If you can’t find it, you could substitute thyme or oregano. Heat a large skillet over medium high heat and add the olive oil. Add the eggplant to the skillet, making sure it can fit in a single layer. If your skillet isn’t large enough, then fry the eggplant in two patches. Sprinkle the eggplant with salt and za’atar. Fry the eggplant until golden on one side, about 3 minutes, then rotate the eggplant. If the pan is too dry add more oil (eggplant loves oil). It might get quite dark and that’s okay. The darkness is where the flavor comes in. When the eggplant is fried on both sides remove and place in a large bowl. To make dressing, add all the ingredients and shake well. The dressing should be oily in texture. Taste the dressing, and add salt and pepper to season as needed. 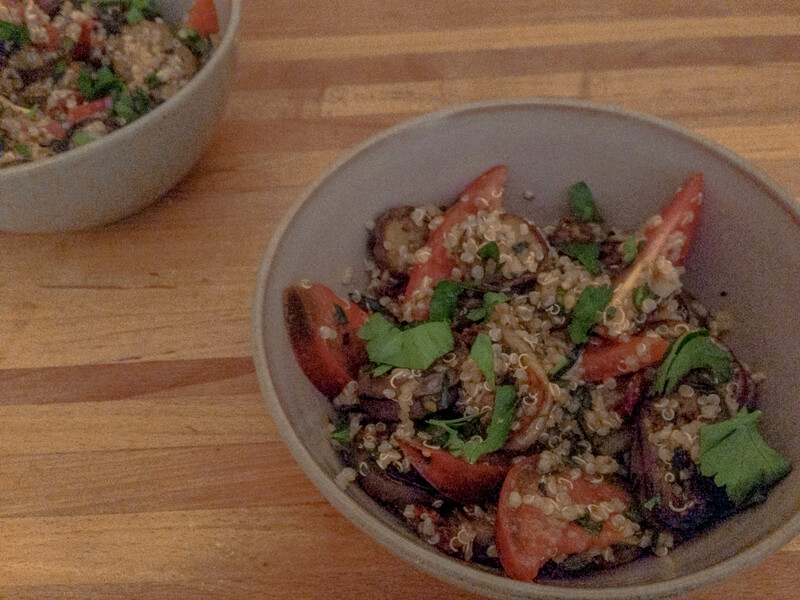 Combine the eggplant with the quinoa, tomatoes, sun-dried tomatoes, herbs, and dressing and toss well. Taste for seasonings. The salad should have more dressing than an ordinary salad, and should taste as if it’s being embraced by the oil. Serve at room temperature, preferably outdoors in the company of good friends.